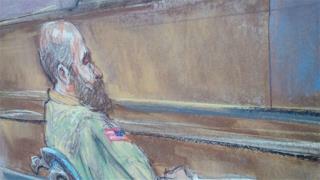 (Newser) – Nidal Hasan, the soldier on trial for the 2009 shooting rampage at Fort Hood, rested his case without calling any witnesses in his defense today. About five minutes after proceedings began, the judge asked Hasan—who is representing himself—how he wanted to proceed. He answered: "The defense rests." During his brief opening statement, he said evidence would show he was the shooter, and he said he'd "switched sides." I hope he gets the firing squad cause that is what he deserves or the gas chamber. Nidal Hassan is a coward and deserves the death penalty. Whether the panel of judges have the balls to give him the death penalty is yet to be seen. Than there's the carrying out the death sentence I hope its carried out quickly. OK, now the firing squad? Or is Obumma gonna step in and say this could have been him? He had planned to call 1) Bin Laden, and 2) Saeed al-Shihri but both of them met their demise. To help ward off these loonies in the future, when they do kill him, douse him in pig fat just before he gets lethal injection.